Other than the myriad opportunities for cooking, eating, and general merriment, one of our favorite things about the holiday season is decorating. We spend hours preparing dishes for Thanksgiving, but what good is a beautiful meal if it’s not served in an equally stunning setting? Enter Thanksgiving tablescapes. There are oh-so-many ways to jazz up place settings for this November feast, and we’ve included a few guidelines and ideas that will make your milieu as fantastic as your food without have to spend lots of time and money (that could go into your recipes instead!). With no distractions of gifts or ceremony, Thanksgiving is all about food and conversation. So, don’t impede on mealtime chatter with awkwardly large decor that blocks your guests from one another! No matter what arrangements or candles you decide to put on the table, keep them on the smaller and lower side so that family and friends can see each other clearly sans massive candelabra. We love to repurpose old jam jars for votives and smaller arrangements—rustic chic! For a big meal like Thanksgiving, place cards and pre-planned seating are a must. Luckily, there are myriad fun and creative ways to create place cards. For a family-friendly approach, enlist some eager young helpers to make hand turkeys decorated with names. Or, if you’re already making cookies or roasting nuts, reserve a batch for this purpose, wrap them in bags with name-tags and your guests will have a snack and know where to sit! (Center)piece it TogetherWith the glorious Fall bounty available at farmer’s markets, don’t shy away from using your gorgeous produce hauls on the table! Arrange squashes, mini gourds, and decorative dried corn in baskets or just artfully lay on the table for a simple yet seasonal way to jazz up the meal. If you’re feeling a surge of creativity, scoop out pumpkins, paint them and then place dried flowers in the cavity. The perfect touch is just a few steps away! Wine Glass Markers are a Must-HaveFor wine and cocktail-loving adults, Thanksgiving is also an opportunity for a fabulously booze-filled meal. But, with the promise of lots of wine comes much wine glass confusion. Provide a wine glass marker for everyone so they can keep track pre-and post-turkey (and so you know who abandoned their glass around the house….)! You can include kids by having them mark their plastic cups as well—they’ll have fun being part of the celebration. Abra CandelabraCandles add even more atmospheric décor to a holiday meal, and we take any opportunity to accessorize our table (and every room possible) with them. 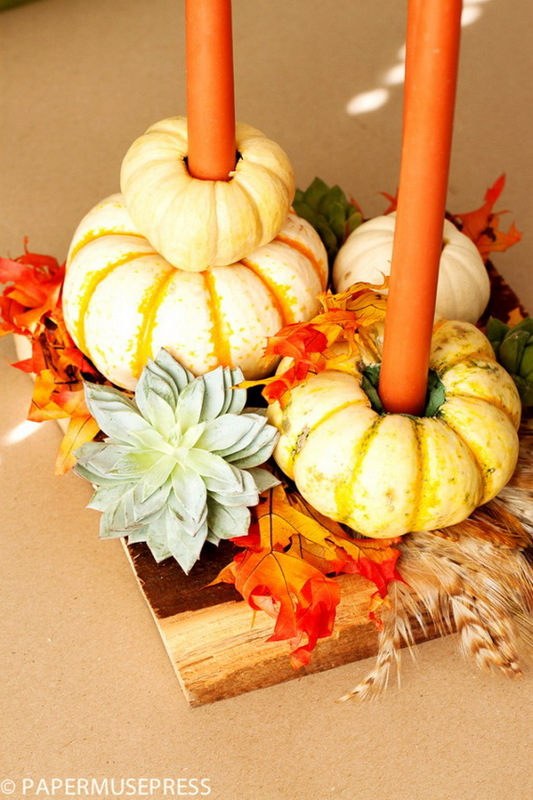 For a colorful, homemade candle holder, simply use wine bottles filled with grains and lentils or, if you’re feeling extra DIY, drill into pumpkins or wood for a gorgeous rustic approach to mood lighting.